On Tuesday something happened in Tampa Bay that didn't receive proper attention: Connor McDavid came to town and played in a hockey game. The Lightning battled the Edmonton Oilers to a tougher-than-it-looked 5-2 victory in a game that featured the greatest hockey player in the world (probably). There was a distinct lack of buzz amongst the crowd at Amalie Arena. 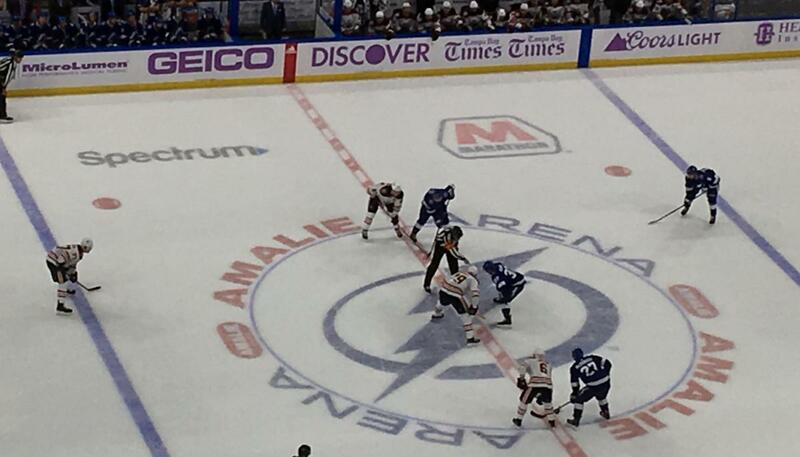 To the random observer, this was just another Lightning game. Nothing special, just a typical Tuesday night game in the early stage of the season. Many of the Lightning fans I talked to were mostly indifferent to the prospects of seeing McDavid live, not having much to say the opportunity to watch him in-person. However I was able to find a few that shared in my excitement. “He’s definitely the most electric guy in the league,” Jake Gilmour said. Gilmour, from Pickering, Ontario, is a soon-to-be professional lacrosse player with the Denver Outlaws. He is finishing up his education at Saint Leo University. He once played against McDavid back when he played Pewee-AAA hockey. According to Gilmour, his team lost 8-1 and McDavid scored seven goals. This was the first time I have seen McDavid live, and he did not disappoint. On a single shift during the first period he: got in behind Lightning defenseman Ryan McDonagh and forced a poke check from goaltender Andrei Vasilevskiy; picked up a loose puck in his own zone and created a two-on-one with his blazing speed; and raced to a loose puck in the corner and set up linemate Ryan Nugent-Hopkins in front of the net for a backhand try. Another interesting fan perspective is the desire to see how your team plays against him, a viewpoint held by Canadian transplant turned-Lightning fan Brian Steves. “I’m excited to see him play live. I’ve watched him a lot on tv, but first time live,” Steves said. “You’re talking about a guy with that kind of skill, it’s always interesting to see him play, and also how your team stacks up against a player like that. McDavid finished the game with 5 shots on goal, tied for second-most in the game, but was held without a point for just the second time all season. He had one play where he split four Lightning defenders, deking Slater Koekkoek and cutting in on goal. What sets McDavid apart from the rest of the league is his ability to do everything at such a high speed. He is faster with the puck than without the puck, something you notice quickly when watching him live. “He basically has the turbo button compared to most players on the ice,” Reul said. “He seems like he’s twice as fast, all the time. For more great sports content about the Bolts and more, check out 813area throughout the year. And be sure to register: it's free!